Do Automatic Car Washes Do More Harm Than Good? Automatic/drive-thru car washes are more popular than ever, because – and you’ve guessed it – they save time and hassle. But are automatic car washes safe for your car? In fact, in many instances, they are the safest course of action for many car owners who want to keep their car clean. Often, do-it-yourselfers don’t use enough water to safely remove dirt; or they wash the car in direct sunlight – which can burn spots in the paint. Or they use the wrong type of soap (such as dish washing detergent), which removes protective wax and leaves a chalky residue on the finish. Or any one of several common mistakes can end up doing more harm than good. Keeping your car clean and the finish looking good can also mean higher resale value when it’s time to replace it. All else being equal, a car with faded paint and a dingy overall look sells for 10-20 percent less than an otherwise identical vehicle that’s been well maintained. So how often should you have your vehicle washed? That depends on how quickly it gets dirty – and how dirty it gets. For some cars, once a month or so is sufficient, especially if the car is lightly used and parked in a garage. But some cars will need a bath more often; those that are parked outdoors and exposed to bird droppings or tree sap, or driven in areas with long, severe winters, where the roads are salted to remove snow and/or ice. Be sure it’s brush-less. Some older car washes still use abrasive brushes (instead of cloth), which can leave small scratches in a car’s finish. On older cars with single stage paint (i.e., no clear coat above the color coat), light scratches could usually be buffed out. All modern cars, however, use a “base/clear” system with a thin, transparent layer of clear coat on top of the underlying color coat to provide the shine. Once this thin clear coat is damaged, often the only way to restore the shine is to repaint the damaged area. Another safe(r) bet is the touch-less car wash, using only high-pressure water jets and detergents to clean the car – without physically touching the car. With this system there is virtually no chance of your vehicle suffering any cosmetic damage. Also, some areas have self-service coin-operated hand washes, which are great for spraying away heavy dirt buildup. You’ll usually need to bring your own bucket, wash cloth/sponge and dry towels, though. Watch out for the after-wash wipe-down. Most drive-thru washes use a strong jet of heated air to force excess water off after the car goes through the wash. Many full-service car washes will then have you drive the car (or drive it for you) away from the wash area to be hand-wiped by attendants. This is usually OK — provided the attendants are using fresh, clean (and soft) towels to do so. Be alert on busy days, however, when a number of other cars have gone ahead of you. If you see the attendants using obviously dirty rags to wipe the car down, you should say “thanks, but no thanks” – and drive away in a wet car. Dirt and other abrasives in the rags can scratch the finish just like sandpaper. Simply driving away from the wash and letting air flow over the car to dry any remaining water won’t hurt anything, and is the best guarantee of a no-damage experience. Any lingering streaks can easily be cleaned up at home yourself using readily available spray cleaners designed for just this purpose. Honda Pro Spray Cleaner & Polish is excellent for this; it also provides UV protection and easily and safely cleans off bugs, tar and road grime, etc. without water. Hold off on the extras. A works car wash can cost twice as much as the basic wash, but you may not be getting twice the wash for your money. Undercarriage rustproofing, for example, is of dubious value. Effective rustproofing is applied to brand-new metal, in order to seal it from contact with external corrosives such as road salt. Most new cars are extensively rustproofed at the factory during the assembly process; further treatment is superfluous — and a money-waster. On the other hand, if the wash offers an undercarriage bath, it may be worth the additional cost. Jets of water sprayed directly underneath the car can break loose accumulated crud that would be difficult (and unpleasant) to try to remove yourself using a garden hose. It’s also important that underbody drainage holes not be obstructed by mud and other buildup; accumulated moisture can accelerate rust or (in the case of the air conditioning system) lead to the formation of mold in the system. The undercarriage bath should help keep those drain holes clear. Do, however, think twice about spray-on wax. This typically adds at least a couple bucks to the cost of the wash and while it doesn’t hurt anything, it’s no substitute for hand-applied polish/wax. Spray-on “wax” may provide a short-term gloss enhancement, but doesn’t protect against UV sun damage the way hand-applied wax does. Ditto the cost of having an attendant spray Armor All (or a similar protectant) on your tires to make them shiny. The cost for this extra can be equivalent to the cost of buying an entire bottle of the stuff on your own. Wheel and tire cleaning is an exception; the heavy-duty cleaners used by the car wash do a great job of removing baked-on brake dust, etc., that can otherwise be a real chore to clean on your own, using over-the-counter cleaners, a hand brush and a hose. It’s especially important to keep aluminum alloy wheels clean; brake dust can permanently stain wheels if it’s not regularly cleaned away. And finally, make sure your car is OK before you leave. 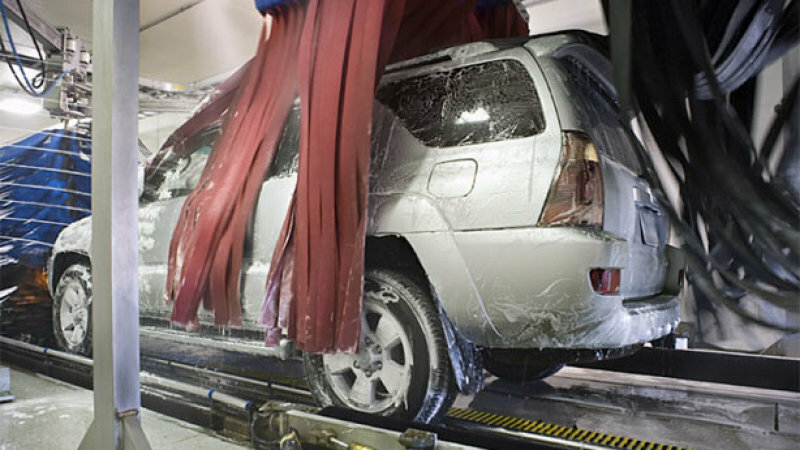 While many car washes will have a disclaimer posted that they are “not responsible for any damages that may occur” as a result of running your car through their wash, that doesn’t mean you should automatically absolve them of any damage their equipment or personnel may have caused. If you notice something, ask to see the manager and point it out to him; whether legally liable or not, he may offer to fix the problem in the interest of customer relations. And even if he does not, you can still pursue the matter at a higher level (such as the company headquarters, if the car wash is a franchise). If you have a cell phone with a camera, use it to take a photo of the damage in order to support your claim. And while it should go without saying, you should never leave your purse or other valuables in the car if you use a wash where an attendant will have access to the vehicle’s interior. Copyright © Storm Hunter. All Rights Reserved.